We have baby changing rooms facilities in all women and men bathrooms, which are equipped with a changing station and comfortable seating for breast-feeding in women bathrooms. We offer you car wash services while you enjoy shopping in our centre. Simply ask the staff in the parking to assist you and give you more details. You can easily exchange your local currency with Emirati Dirham from “Al Ansari Exchange” located at South Entrance (Entrance C) on the ground floor. In addition, you can withdraw cash from ATMs available close to South Entrance (Entrance C) ground and first floor (Entrance D), North Entrance (Entrance A) and next to Carrefour entrance inside the mall. The mall is equipped with qualified first aid team for minor injuries. Customer service desk is also equipped with a small first aid kit. With City Centre GiftCards, enjoy giving your family and friends the freedom to select their own gift at any store, cinema or restaurant, whenever, however. City Centre Ajman has got a lot of stuff for your little ones! Read more below to explore your options! Misplaced or lost an item during your visit? Contact customer service desk located in the central galleria for assistance. Free Wi-Fi service is available in the mall. Please connect to MallConnect from the list of Wi-Fi networks. For any assistance, please visit the Customer Service Desk. 3,300 parking bays are available in the mall located at the Main Entrance, North Side (Entrance A) and South Side (Entrance C & D). Prayer rooms for men and women are located on the first floor at South Entrance (Entrance D) i.e. near food court. Tourists can benefit from free Shuttle Bus service – to be picked up and dropped off back to their hotels in Ajman and Sharjah. There are designated parking spots for persons with special needs located close to the mall entrances. Dedicated Taxi drop-off and pick-up area is located at South Entrance of the mall on ground floor. 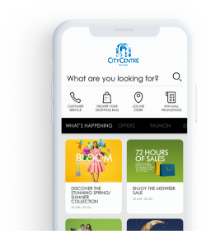 To make your visit to City Centre Ajman a memorable and care free experience, offer an array of services specially designed to care of customers' needs and help them shop with ease. Visitors to the Mall can make use of these services by contacting the customer service desk, which is located on the ground floor at the main entrance. A premium valet parking service is being offered at Entrance ‘C’, enabling you to leave your car safely with one of the employees and return it to you at the gate when you finish shopping for a small fee. Wheelchairs are available free of charge at customer service desk in central galleria, based on availability. © 2019 City Centre Ajman. All rights reserved. Majid Al Futtaim Properties.